This 5-day PSMB Certified Train-the-Trainer Program provides you with the necessary tools to initiate and implement workplace training, as well as to evaluate the learning effectiveness towards continuous improvement. It helps you to transfer the required skills, knowledge, and the expected behavioural change to the target audience through a well-organised step-by-step learning methodology. Conduct workplace assessment to evaluate training effectiveness for future improvements. 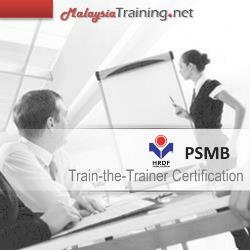 To get certified and awarded by PSMB for the Train-the-Trainer Certificate. 3.1 What is Training Needs Analysis? 5.6.2 Application of the appropriate questioning techniques to enhance level of understanding. 5.6.3 Provide feedback through “Sandwich Approach”.